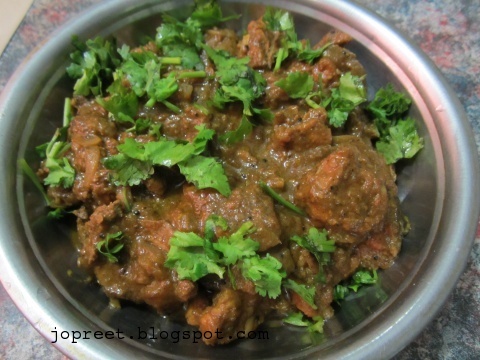 Chicken Haldighati, I found this recipe in a oven book but i didnt try it in oven. Slightly altered it to my taste and result was excellent. It was spicy and full with flavor. Prepare the masala paste by grinding in a mixer. Keep it aside and heat oil in a kadhai. Temper mustard seeds. Add sliced onions and saute a while. Add ginger-garlic paste and cleaned chicken. Fry for 5 mins and add masala paste. Mix all and add salt to taste. Cook it covered till the chicken is cooked. Add water if needed. Add milk and lemon juice. 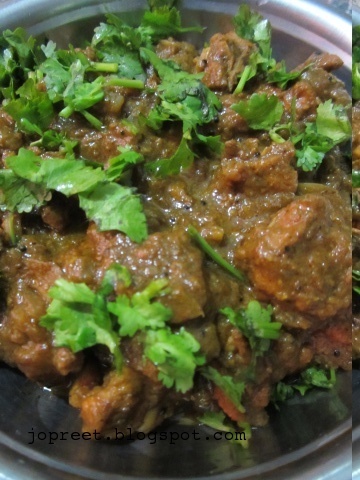 Cook till the gravy becomes thick and garnish with chopped coriander. Serve hot with rice or roti. Something different..looks delicious and spicy.